Amateur food photography is nothing new. What else can be said about the now mundane practice of pausing before a meal to document it so the image can be shared and admired? Perhaps nothing, but I’m going to share the following experience, anyway. So there I sat, eating a passably tasty veggie wrap and enjoying the fresh air and the murmured conversation that filled it, when into my field of vision walked a trio of private school students with their own lunch trays. They selected a table at the edge of the veranda that overlooked the gardens, set down their trays, and sat. But as soon as they had done so they were standing again, each of them taking a step or two backward with their smartphones held aloft, attempting to properly frame their respective meals. After taking satisfactory pictures, they sat and proceeded to eat. Daily documentation — visual — as cultural practice. The three girls photographed their curated collections of comestibles, making the quotidian significant, adding a layer of ritual (visual documentation) to another type of ritual (meal sharing), which will in turn be ritually disseminated on social media (sharing of the visual documentation of meal sharing — nay, meal plating). Or does the ubiquity of such a practice mean that the quotidian is just that, and layering these rituals temporally is no longer in itself significant? When so many snap pictures of their food to share them in the pursuit of technologically mediated attention, is that not simply a mundane cultural practice? No less meaningful, but meaningful in a proscribed, ritualized way. I suppose I mean to say that it’s no longer art. This is a series of questions that circle back on one another. I do not have answers. Anthropology seems at odds with itself. As a discipline, it’s charged with understanding people from their own cultural perspectives, maintaining that meaning arises from use. Thinking through these tenets, it leads to a tension between intention and interpretation. I’ve been thinking about this in terms of identity and personhood–who someone is, how that “who” comes into being, and who has the power to determine who the “who” is. So one reason humor “happens” is when two usually unrelated things are presented right next to one another. In this case, the cow is being simultaneously given subjectivity by an unseen speaker (the card/speaker addresses the cow in the second person–you) and is immediately objectified (made an object by the card/speaker telling the cow how useful it is as food and whatnot). So the humor is in the unexpected collision of these two states of being that are bestowed upon the cow: it is given subjectivity only to have it taken away in the service of a human smile. It is also funny because it combines admiration and brutal honesty. The narrator of the card is writing this ode of appreciation to the cow because it can be killed and used for food and clothing and other human needs. The narrator is defining what the cow is in human terms. It is appreciating it for its lack of agency–its lack of subjectivity–even as it ironically addresses it as if it is a subject, not an object. Of course, the entire card objectifies the cow–an icon both standing for itself as an individual who can be addressed (although not easily interpellated*) as a singular subject, as well as a representative of an entire category of non-human animal. The cow is an object that conveys humor to the reader, the consumer of the card. Who is a human. Who identifies with the sentiments expressed on the card in the act of chuckling at their meaning. Haha, cows are delicious and useful! That cow doesn’t know what it’s in for…ha! The narrator could be interpreted as tricking the cow, first lulling it into a false sense of camaraderie (you implies that the speaker and the addressee are equal in the sense that they can communicate with one another as individuals), and then destroying those expectations built just moments before by putting the cow in the place of being a mere representative of a type. 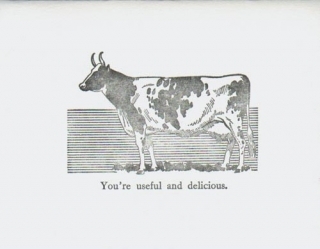 A class of animal that humans have categorically created to be the very things that the narrator is seemingly praising the individual cow for being: useful and delicious. See cow? You aren’t a person. You’re just an object. A thing with desired characteristics. It’s quite an instance of animal cruelty, when you think about it. Albeit a funny one that only the humans are in on. Which is in turn exclusionary and therefore rather mean. *I use interpellation here in the Althusserian sense, although I’m also twisting it. For Althusser, the subject is always already existent, created by social processes. While I think the subject still has to interact with the social situation in order to become a subject of the interaction (uptake/use makes meaning!). Althusser contends that the social interaction itself creates subjects; that the structure makes subjects of what the structure hails. Maybe…I’m a bit fuzzy on this, actually. Grad school was a while ago. ANYWAY, since I am of the nihilistic relativist opinion that there is no way to absolutely know whether or not you are communicating with another species–or even another human being who is ostensibly of “the same” culture–it would be very difficult indeed for the narrator of the card to claim that the cow it is addressing was interpellated with the narrator’s use of “you,” even if the cow chose at that moment to serendipitously look over at the narrator. I was having coffee with someone who mentioned how cool it felt the year she knew a person who had won an Oscar. She described watching the show and pointing at the TV, remarking “hey, it’s Joe!” because she had worked with him in the past. She seemed surprised that she had reacted this way; that she had found that short experience so cool. The coolness effect that comes with the realization that someone you know is now momentarily famous intrigued me. It is partially a sharing of the prize–in knowing the person you feel a small sense of ownership over their accolades, as if you, by knowing them, had contributed to their recognition/distinction. As if you feel rewarded for knowing someone who was actually rewarded. A closeness to the prize and the public recognition of hard work and talent via your social closeness to the person actually receiving said accolades. It’s not really about the cultural capital, the bragging rights that come from telling the story that you know someone who won a nationally recognized award. And in the instance I began with, it certainly wasn’t name-dropping. (Who the hell is Joe? It didn’t matter that I didn’t know–it only mattered that it was a person she knew.) It was about the coolness of intimately knowing someone who was briefly a public figure. But it was more the connection itself, and the way the connection works, that interested me in this story. The unexpected delight of not quite a coincidence, but a connecting to thousands (millions?) of nameless others who are simultaneously watching this same person that you know accepting an award. Someone in your life is now connected to everyone else who is witnessing the same event. It is a cool feeling because it means that you are now connected to these strangers–you are all in each others’ lives. This effect has been discussed before in various ways…how we track our own lives using the lives of celebrities and public figures. This is why media outlets announce the deaths of famous people. Because viewers care. We they to know, in a way. Because it reminds viewers of their own life trajectories. This particular awards show connection phenomenon is a variation on the same theme. It’s about connecting to strangers through particular people, making these shared people icons/symbols in the process. It solidifies our imagined community; our commonality as mortal beings. And it’s also pretty cool.